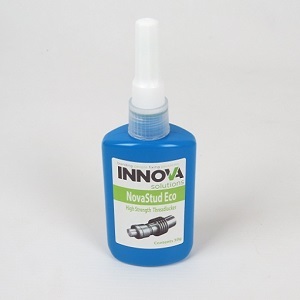 NovaEco anaerobic adhesives cure in the absence of oxygen promoting bonds with a high shear strength. Frequently used as ‘thread lockers’, the adhesive remains liquid until isolated from oxygen between the nut and a bolt on a threaded assembly, curing to a high strength cross linked thermoset bond. They are produced from our latest ‘white label’ non-hazardous technology ensuring no hazard symbols, nor safety or risk phrases are required. 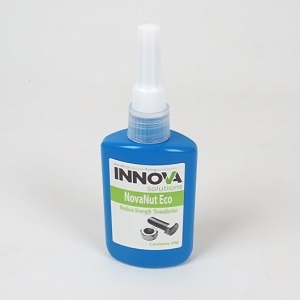 NovaNut Eco – Medium Strength Threadlocker is an oil tolerant medium strength threadlocker, that cures anaerobically to lock all types of metal threaded fasteners. It is designed for applications that require future disassembly with standard hand tools, and offers excellent temperature and solvent resistance once cured. The product is also thixotropic, which aids assembly by reducing the migration of the liquid adhesive following application. This grade can even cure rapidly on plated, oily metal, or inactive surfaces. 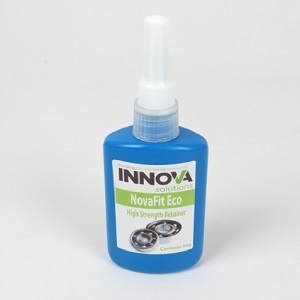 NovaFit Eco – High Strength Retainer is a high strength medium viscosity retaining compound, designed to bond close fitting metal surfaces with an ultimate structural strength. Especially suited to bonding cylindrical fitting parts, whilst maintaining an unfaltering bond under all levels of cyclic load stress distribution. Choose or need help finding the correct NovaEco Threadlocker for your application?